Inside: Just because you don’t have a lot to spend doesn’t mean you can’t decorate your home! Use these cheap decorating ideas to create a home you love for next to nothing. I have a confession: I compulsively rearrange my furniture. I do it all the time, to the point where my husband wonders whether or not the house is ever going to look the same when he walks in the door after work. Why do I do it? It’s not exactly easy to rearrange furniture by yourself. I do it because it’s the easiest of all cheap decorating ideas. Rearranging furniture gives your home a whole new look for FREE. I want my home to be beautiful, but we have very little money to invest in making it so. I had to get creative to make a home I love with only a few dollars to spare. Thankfully, creativity (and necessity) birthed several cheap decorating ideas that I wouldn’t trade for all the expensive home decorations in the world. I used to get a Better Homes and Gardens magazine in the mail every month – a gift subscription from a friend. 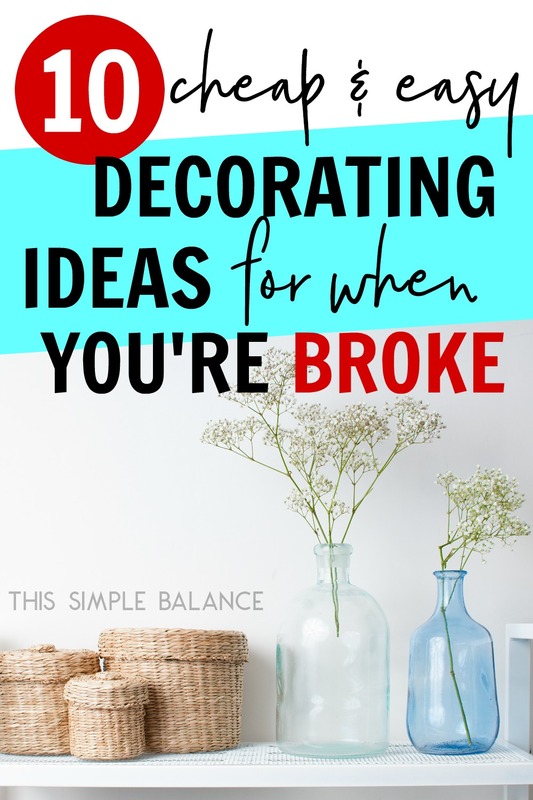 I’d flip through the pages and see tons of beautiful decorating ideas that were so NOT cheap. I love my home to be beautiful, but our home decorating budget is pretty much non-existent. Staring at that BHG magazine every month not only made me want things I couldn’t have; but it also killed my creativity. The only ideas going through my brain were from the designers staging those picture-perfect homes. There was no room for cheap decorating ideas. Eventually, I pulled the plug on the BHG subscription, even though it was free. I needed time to get comfortable in our home, to love it in its current state, to be able to see possibilities again. After several years of decorating on a tiny budget, I’ve gotten pretty darn good at it. If your house is jam packed full of junk that you aren’t using and/or you don’t love, it NEEDS TO GO. Just getting rid of clutter can give your home an instant and dramatic facelift. There are a million decluttering resources out there, but I recommend The Joy of Less. Organization comes into play after you get rid of all the clutter. If you try to organize before that? You’re just rearranging the clutter, and you will need to do it all over again pretty quickly. Organization post-decluttering will be fairly easy to maintain. Unlike the Container Store wants us to believe, you don’t need to spend hundreds of dollars to get organized. Organized Simplicity offers several ideas for how to recycle and beautify everyday containers. I’ve already mentioned this technique, but I love it because it is one hundred percent free. Try to look at all your existing furniture with new eyes. How can you use it differently to give your home a whole new look? 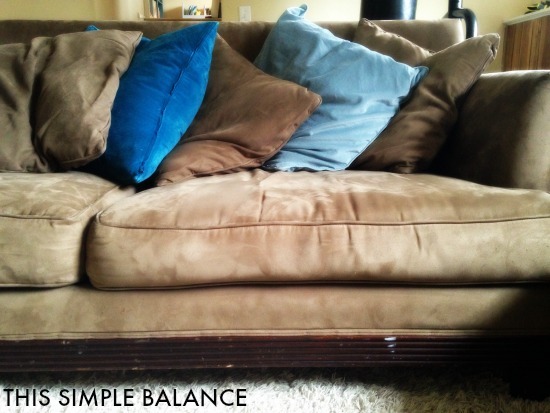 Can a couch be free-standing instead of up against a wall? Can you divide a room in half using your furniture in order to create two spaces out of one? Does a furniture piece need to be used on way, or can you use it creatively for another purpose? 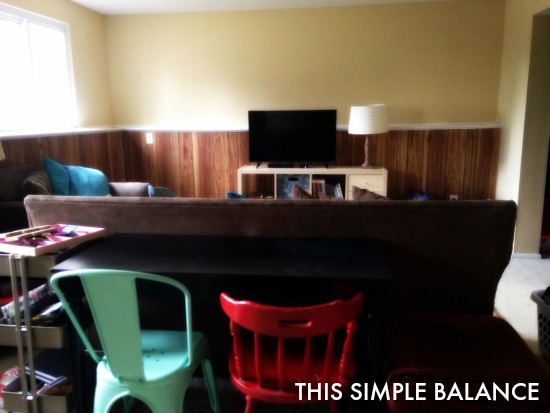 We purchase an IKEA console table second-hand from a previous renter in our first apartment. Since that time, we have used that console table in pretty much every room: the kitchen, a bedroom, the living room, the dining room. We use an inherited secretary desk for our entryway. Its drawers hold hats and gloves during the winter, extra shoes, and items that need to be returned to friends. We use the actual desk to hold outgoing mail, my wallet, and random extra items that need to be put away. I just rearranged our living room to create room for a second “table”. I found the basic desk at a second-hand at a local thrift store. Put alongside the back of the couch, and it is the perfect extra space we need to homeschool in a small house without going crazy. Think outside the box to get the most out of what you already have. Branches can be hung on walls as unique décor. Obliging fields can provide free wildflowers to put in vases picked up from the thrift store. Friends with house plants are generally happy to provide clippings to grow your own. If you have a green thumb, grow your own flowers. The only cost is the seeds and soil and cheap planters (again, thrift stores for the win!). Fake flowers, while not free, are another way to brighten a room for a one-time cost. You can rotate the flowers seasonally, or use them in different rooms in your house over time. 5) Cleverly disguise unsightly furniture. We purchased one couch brand new in the history of our marriage: an IKEA Ektorp sectional. Almost everything else we were given or purchased second-hand. With time, I’ve come to love our $50 yard sale couch set, even with the cat claw marks on the ends. The armchair I initially declared ugly now adds character to our family room. The claw marks on the side of the chair are hidden by an end table. A throw blanket draped over the armchair complements and softens its interesting (unique?) pattern. A few of the pillows that serve as the back to the yardsale couch are recovered with inexpensive IKEA pillow covers. New furniture is extremely expensive. If you can find ways to make your existing furniture beautiful, you can save a ton of money in the long run. At the beginning of this year, I couldn’t WAIT to get new furniture for our family room. With time, I’ve come to love that $50 yardsale find and have no intentions of replacing it. My kids can do pretty much anything to it without any noticeable damage, and I’ve come to embrace the brown. 6) Recover existing pillows with cheap covers. Throw pillows are an easy way to add color and function to a room, as long as you don’t get too many. You can find inexpensive throw pillows at Christmas Tree Shops and at Target on Clearance. An even cheaper way to change your décor is to recover existing throw pillows with cheap covers (IKEA) or make your own. Joann Fabrics frequently provides high percentage coupons for fabric. You don’t even need a sewing machine! The internet is full of simple tutorials for how to sew a pillow cover by hand. 7) Decorate with useful, everyday items. Any time a useful item in your home legitimately needs to be replaced, choose something that can also serve as décor. 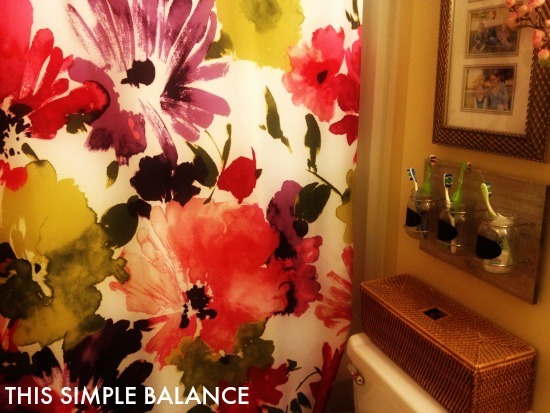 Need a new shower curtain? Buy one that is a true work of art. Your bathroom won’t need anything else for decoration. Need a new lamp? Choose a color and shade that adds beauty to your living room. Need new kitchen towels? Target frequently discounts their seasonal kitchen towels by as much as 75% off. Pretty towels hanging on your oven can make your kitchen beautiful for just a few dollars. 8) Get old maps and frames from the local thrift store for cheap wall decor. 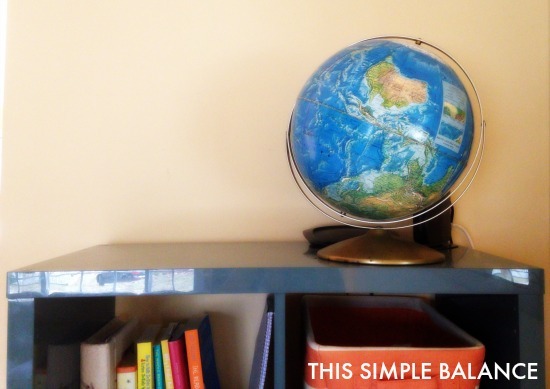 Maps are one of my favorite ways to decorate. You can easily find old maps at the thrift store (or just ask your parents – they probably have several just sitting around). Pick up frames from the thrift store or the dollar store, and you can easily create an interesting and unique focal wall with either one large frame or by cutting up several maps for use in several small frames. This is a minimalist decorating tip. If after decluttering, you still have a good amount of decorating material, don’t use it all at once: rotate it. Store the rest in deep storage. What an easy way to change up your décor every few months using what you already have! 10) Shop local yard sales for cheap furniture and home décor. Yard sales can be hit or miss. Make sure to search for yard sales in advance. Only visit ones that seem to offer what you’re looking for. If a yard sale doesn’t advertise furniture and you ONLY need furniture, it doesn’t make sense to waste time visiting that one. You will also probably end up buying things you don’t need. Yes, you can accumulate clutter both at Target and at yard sales (only difference is it will be a less costly mistake). I steer clear of both unless I am looking for something specific. If you have the time and patience to teach yourself how to repaint dressers or reupholster furniture, you will be able to do even more with yard sale finds. You may need a social media fast if your Instagram feed is full of beautiful, expensively decorated homes in order to fully comprehend all the cheap decorating possibilities I mentioned. Just because you don’t have a lot of wiggle room in your budget doesn’t mean your home can’t be beautiful. Stop waiting to be able to afford to expensive home décor. Try these cheap decorating ideas first. Who knows? When the time comes and you do have extra money to spend on decorating, you might not even want to. A home decorated with a few bucks and a whole lot of creativity is beautiful in its own way. Who knows? You might come love your uniquely decorated home so much that when the money comes, you don’t want to change a thing. Some great tips here, June. It’s amazing how much of a difference simply getting rid of clutter can make to any room. And when all else fails then a couple of strategically placed throws, new cushion covers, natural light and natural flowers really revive a room. Hello June, your ideas for cheap decoration is quite impressive. With the help of your ideas we can decorate our home without spending lot and they will look awesome. I like the idea of rearranging furniture most. Thanks for this valuable post.